Last month we talked about some of the problems horses can exhibit and the different standards that are applied to determine a “broke horse.” We discussed what a broke horse is not: a horse that refuses to go forward, is lazy, won’t move off the leg, doesn’t understand or respond to cues from the inside or outside rein, doesn’t back up with energy, and a variety of other behaviors. This type of horse may not be a problem horse but may simply be uneducated. In one of my Responsive Riding clinics, I asked riders to rate their horse’s backing skill on a scale from one to ten. Most rated their horses a seven or eight, one rated the horse at nine. I rated all of those horses between one and three. This is an example of the different standards that are applied. Those horses were not being responsive or obedient. To me, being obedient does not have a negative connotation. It simply means the horse knows and responds appropriately to cues. Those riders may have been giving incorrect or unclear cues or the horses may not have ever been taught to respond properly. I’ve seen too many riders spur and spur, or continuously whack with a dressage stick, get little to no response and then stop. With no follow through, the horse doesn’t learn, becomes dull and often cranky. As owners and riders, it is important that we raise our standards, expectations and set goals for our horses. It is also important to raise our own skill level. Some people say that horseback riding is supposed to be fun but I don’t see that riding a horse that won’t move forward or go where you direct it to go, is fun. We need an educated horse but we also need to educate ourselves to pay attention to what our horse is or is not doing and to train ourselves to be more effective in our communication with our horse. 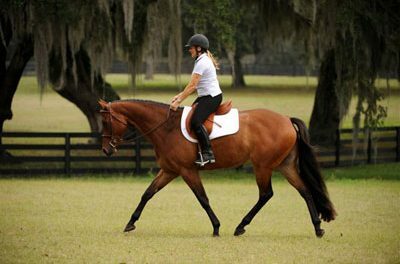 A broke or finished horse is obedient to the rider’s seat, leg and rein cues. When I put my left leg on a horse with one or two ounces of pressure, I expect that horse to move off my leg, the hindquarters or the shoulders to move or the horse to do a leg yield. When I put the outside rein on, just a touch, I expect the horse to move off that rein. When I cue a horse to stop using my seat, I expect the horse to stop. We all need to know and understand the physical cues I am discussing. They are universal for every discipline. Safety is always our first concern. We want a finished or broke horse that is predictable. If you don’t know how your horse is going to react on the trail, you are more likely to be frightened than to be enjoying the ride. We want a horse that is predictable because that is safer for us. All horses can be dangerous at one time or another just because they are living creatures and subject to the environment around them. While their inherent fight/flight instinct is never totally overcome no matter how well trained they are, the more de-spooking we do, the safer they are. We train them to accept spooky things, unexpected noises, movements or circumstances so that they will be less likely to be frightened and react to something new. We don’t want a horse that is afraid of every new noise, movement or bend in the road. We do not want a horse with a high emotional level. To me, a broke horse is a multifaceted horse. The emotional level of a horse allows you to do more. 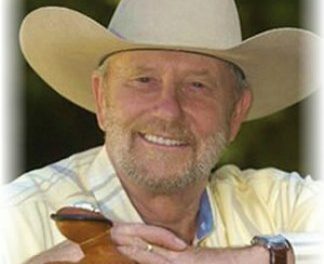 You might do reining patterns one day and the next day go for a trail ride and cross a creek or participate in a competition trail course and drag a tarp or a log. You might compete in cowgirl dressage one weekend and ride in the Fourth of July parade the next. A horse can do all of these things but I think we often limit what our horse can do. While not all horses can be dynamic in all aspects, that should be your goal. In striving to attain these goals, our horse becomes more educated and we progress in our riding skills. Developing these skills opens up a wonderful variety of riding experiences. A broke horse doesn’t come that way from the factory nor is it developed over night. Development is a continuous process. If you find that your horse has not improved much in the last year, then you haven’t defined your goals. Your goals may be what you want to accomplish that day, what you want to accomplish in a week or a month, six months or a year. Look at your goals incrementally and that will motivate you and your horse. If you are motivated, your horse will be motivated. 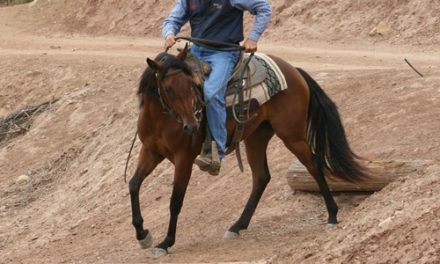 Lets move forward with our horses and strive to have what we call here at the ranch, the ultimate super horse. NextConfidence In The Saddle . . . How’s Yours? 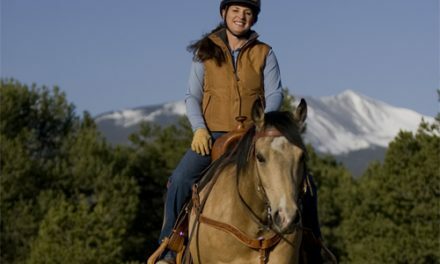 What Can I Do To Keep My Horse Focused When We’re On The Trail?